Rajmata Ahilyabai was the Holkar Queen of the Maratha Malwa kingdom. She was one of the ablest and saintly Queens of India was born on 31st May 1725. She was not only noted for her administrative ability but also for her contributions towards art and architecture. Rani Ahilyabai was a great pioneer and builder of Hindu temples. She built hundreds of temples and Dharmashalas throughout India. She helped widows retain their husbands’ wealth. She made sure that a widow was allowed to adopt a son. Ahilyabai’s capital at Maheshwar was known for its literary, musical, artistic and industrial enterprise. She gave patronage to famous Marathi poets the shahirs, Sanskrit scholars as well as craftsmen, sculptors, and artists. Ahilyabai was breathed her last on 13th August 1795. The reign of Ahilyabai lasted for thirty years. This has become almost legendary as a period during which perfect order and good government prevailed and the people prospered. She was a very able ruler and organizer, highly respected during her lifetime, and considered as a saint by a grateful people after her death. 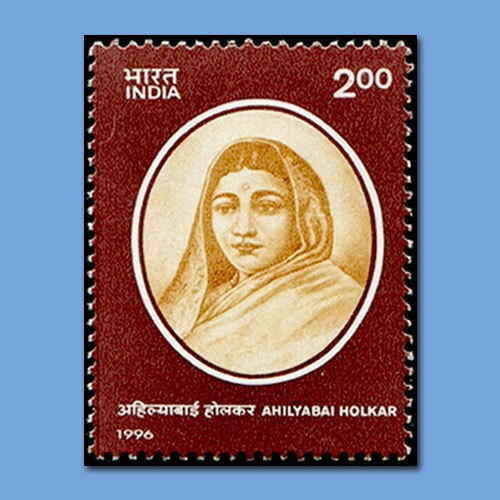 India post has issued a commemorative postage stamp on the death bicentenary of Maharani Ahilyabai Holkar.